How to add VVDI2 BMW FEM/BDC Authorization? V4.3.0 VVDI2 newly add BMW FEM/BDC system key learning, erase key; Add BMW FEM/BDC system reset KM; Add FEM/BDC system backup coding, restore coding.If you have VVDI2 Full or VVDI2 BMW,how can you get VVDI2 BMW FEM/BDC authorization? 1.Purchase from us.This is what we will introduce in our blog. VVDI2 Serial number,if you have some other Xhorse tool,please also provide us their serial number. How to check VVDI2,VVDI PROG,VVDI MB Tool serial number? Back of main unit,it shows the serial number,send them to us is OK.
How to check VVDI Key Tool serial number? VVDI Key Tool back does not tag the serial number,you can check from the carton box. 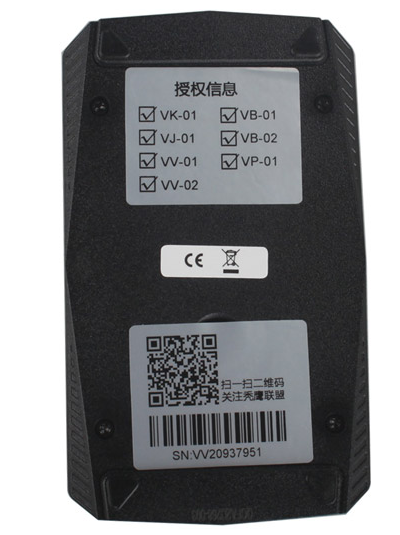 Or if you can not find the carton box,please download VVDI Key Tool update tool software,connect VVDI Key Tool with computer,click device info,it will display serial number,format is :VK********. When authorization is OK,we will send email to inform you.Then wait more than 30 minutes,update vvdi2 firmware.P;lase confirm you use newest VVDI2 software,update vvdi2 firmware. How to use VVDI2 V4.3.0 BMW FEM/BDC Key Programming Function? This entry was posted on August 24, 2017, in car key programmer and tagged vvdi2 BMW FEM/BDC Function Authorization Service. Bookmark the permalink. ← How to use VVDI2 V4.3.0 BMW FEM/BDC Key Programming Function?